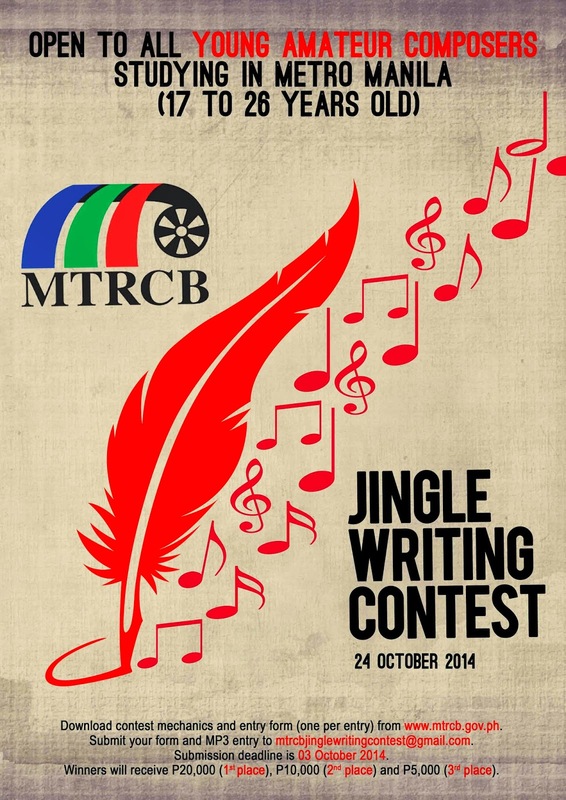 MTRCB Jingle Writing Contest ~ Philippine Freebies, Promos, Contests and MORE! Calling all young amateur composers studying in Metro Manila! The Movie and Television Review and Classification Board (MTRCB) is launching their Jingle Writing Contest based on their advocacy theme, "Matalinong Panonood." It's FREE to join. What you need to do is create an original composition based on the given theme. Lyrics should have easy recall and the musical style should be up tempo, current, bright and inspiring. Another important thing: It must contain the ratings and classification letters G, PG, SPG, R-13, R-16, and R-18. You may enter a maximum of two (2) jingle compositions, either as a sole composer or collaborator. Submit it via email along with the entry form. Prizes at stake are P20,000, P10,000, and P5,000 respectively.